This morning’s treat was to share some waffles and a pretty unique tea with my wife as we watched the snow gently fall outside. 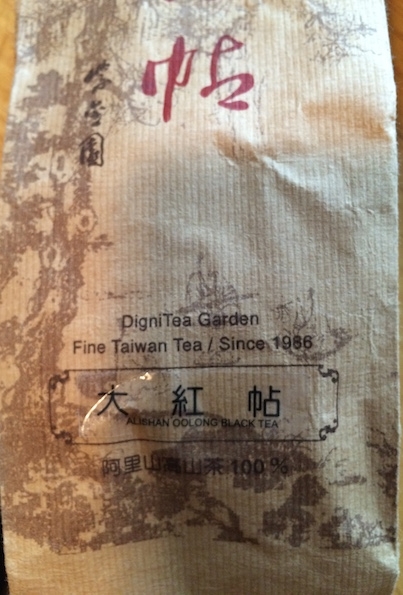 This is one of the teas I bought from a small shop in Taipei called DigniTea, which is a family-run artisan tea company that grows (as far as I know) all of their leaves on Alishan (a rather famous mountain outside of Chiayi). I have of course written about their lovely oolongs before. Unlike their other offerings, however, this one is an “oolong black”, which seems like an unlikely descriptor, yet there it is, right on the package. Well, ok, the package also reads “大紅帖”, or Dàhóng tiē, which to the best of my ability to translate means “big red ribbon”. So perhaps the title in Chinese is just as mysterious and unexpected. While I might expect a title like “oolong black” from a Western tea bag company, where precision in naming is less important than floral descriptions, DigniTea is hardly that type of company. Their Jin Xuan and Qing Xin products are some of the finest I’ve tasted, and their packaging specifies the cultivar, year, and season of harvest. This leads me to believe that the title is not mere embellishment. 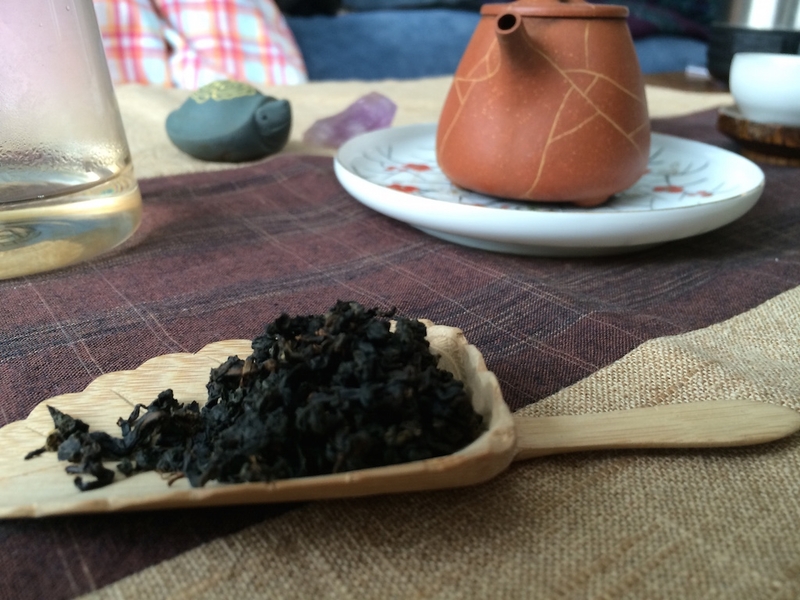 So, how can a tea be made as both an oolong and also a black tea? My only guess is that the style is processed in the rigorous rolling and drying system common to high mountain oolongs but allowed to oxidize longer than any other similar Dong Ding or Alishan. In fact, I’m surprised that I haven’t heard of such a creation before. The dry leaves are dark and rolled into small balls, already giving a unique impression. 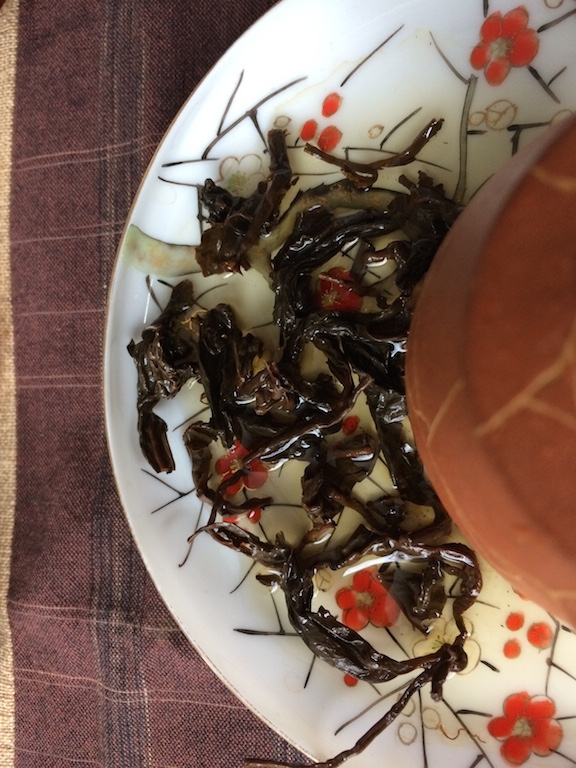 It is as though one took the dark roasted leaves of a Wuyi oolong and rolled them like a tiny Dong Ding. Infused, they produce a beautiful amber liquor reminiscent of a Sun Moon Lake black tea. The taste as well is similar, I think, to that famous Taiwanese black tea (Hong cha, really) known variously as Sun Moon Lake, Red Jade, or Number 18. Sweet and caramel-thick, but with a slight dryness and rough mouthfeel that reminds me of a charcoal roasted oolong, this tea has a gentle but unexpected character. Indeed, every time I drink some my palate is always a little confused. Is this oolong, or is it Hong cha? The DigniTea page designates it as the latter, but this may be one of those cases where the question is simply one of experience and not semantics. The uniqueness of this tea has earned it a special spot on my shelf over the last few years, although there is precious little remaining. But that is a good thing! The way of tea is to remind us that the present moment is fleeting, and that change exists in all things. The seeds of a flavorless teabag exist in even the finest high mountain oolong, if it is not consumed. I am fortunate, and it speaks to the quality of this tea, that my Alishan oolong black has lasted so long while retaining its delightful character. It is time to drink it and move on, giving thanks for all the joy and mystery it has brought to my life. May your tea be warm and delightful during the frigid winter snows. And may your mind find peace in the cup. 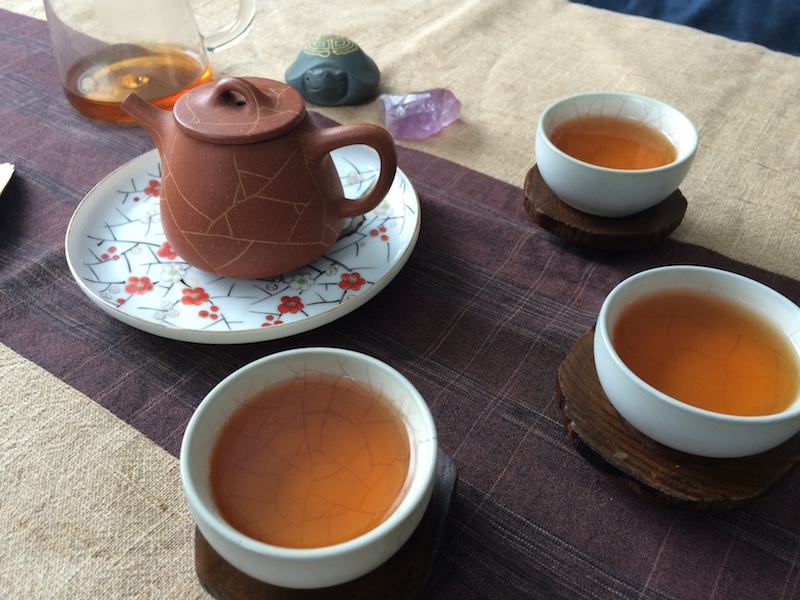 This entry was posted in Tastings and tagged alishan, black tea, hong cha, oolong, taiwan on February 14, 2015 by payton. Alishan black oolong has become one of my favorites. Your description is spot on.